The kindergarten classes had their first Health rotation. We learned about nutrition and how to keep ourselves safe and healthy. 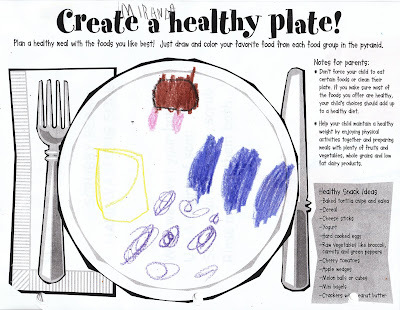 Included was a page on which the child was to have drawn a healthy meal. I'm not sure what they're teaching because on that plate, counter-clockwise from the left, is butter, pasta, grapes, potato, and Tylenol. Today - 15 October - is Blog Action Day and this year's theme is poverty. Notwithstanding the fact that my child doesn't seem to know what constitutes a healthy meal, she does have enough to eat. There are people, many people, who don't get enough to eat. It's a global problem and a local one. In NYC, the posh and glittering home of dozens of Michelin-starred restaurants, 1.3 million people rely on soup kitchens and food pantries. To help some more people eat better, I will make a contribution to the Food Bank for New York of $1 for every comment made here before midnight EST tonight. I don't know how many comments I get on average, but I know it's never been as many as 50 even though I regularly have more than 50 visitors a day. So, lurkers, come out of the closet and help feed the hungry. Regulars, be sure and comment today - it's for a good cause. she sure likes her butter! M's Granny would be mighty proud to see butter given such a place of prominence on the dinner plate! So that's where my dinner went! And this is a great little idea! Tylenol was part of my breakfast this morning. And there I was-- reading at work, and all set to skip the commenting. But having read to the end, how could I? My two year old would eat nothing but butter if I let him. What a great idea. And I have to say, the Child's idea of a balanced meal beats my last few meals, hands-down. Mmmmmmmm, potatoes. I bet not many kids drew protein sources on their plates...protein just is, so, boring! I'd like to do an experiment to see what my kids would come up with. I have one that will eat anything as long as it is orange, which would not make for a very interesting visual. CG would have drawn a pickle, I bet, although I may ask her to draw a healthy meal and see what she comes up with. Definitely a great comment motivator--a very good cause. Commenting for social justice! I can get into that. My offspring wouldn't have any protein on his plate either. How could I NOT comment? Mmmm, butter and pasta and potatoes...I'm hungry. What an excellent blog action idea--there's blogging and action! I also love this idea. You go girl! Kudos and bravo to you. I am trying to spread the word. My son would love this meal. He could actually eat a portion of butter that big. Perhaps the pink things are pomegranate seeds? I'm a little afraid of what my kid would have drawn. Probably just a piece of bologna! Great reason to comment, and that's quite a masterpiece...you must have a budding artiste or chef! great post! i suspect butter looms large because it is yummy on stuff, so maybe that is where the drawing started. also suspect tylenol is part of the deal because the teacher said "healthy," and tylenol helps when one is sick. The Tylenol reminds me of last year, when my then-kindergartner did a five-senses assignment. At Christmas I see ... lights, etc. And I taste: Root beer. tylenol? are you sure they aren't Tums? if I comment twice will you give $2? Hi Magpie - I've been one of the lurkers - thanks for inviting my post. And there's not even one Cheez Doodle. I'd say she's got healthy eating down. What a great idea for poverty intervention! I'm at Motrin girl, myself. But I sympathize with Tylenol on the plate. Tell you what. I'll match it. ($1 per unique comment, up to $100.) I'll give to Neighbor Impact, the feed-the-hungry program in Bend, OR (my town). Redmond area jumped nearly 60 percent [from August 07 to August 08]." That is a fantastic idea. I am going to copy you, is that's okay. And I don't know what's wrong with that meal. She seems awfully sophisticated to me. Meanwhile, what am I doing this week? Helping my child sell cookie dough for $15 a box to raise money for school! I hate this!!! They are a Christian organization, but they never voiced any concern over the fact that I'm not a member of the church or even Christian. It's not organic, or even highest class, but it's filling and it's about $150 worth of groceries for $35 a box, with no income restrictions or limits on ordering. And no, I don't work for them...but they're good people trying to help other good people who are hit right in the wallet by uncertain times. Awesome idea. And I love that plate of food. I am off to take my RDA of Tylenol right now. Maybe they are GMO grapes. What a great idea. I hope you get another couple hundred comments in the next few hours. Here's my comment. Good for you!